The vase on the right was made 12 years ago from wood from one of the original frames of white pine. If you look closely you can see the uniformity and tightness of the year rings. These trees were probably harvested during the final decades of the great lumbering era in southern Ontario and in the Georgian Bay region. There is more about this in the story of the Underwater Wood. When Mr. Bennett sent me the wood, He didn't send a piece or two, he sent a small trailer. In this video here, I am looking at one of the verticals from an original frame. 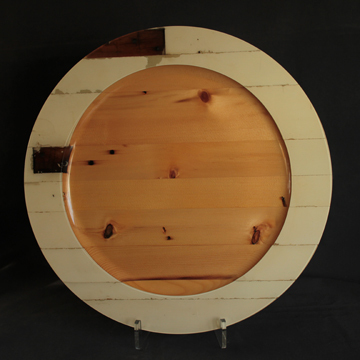 I have decided that I want to make a platter but wish to retain the white finish from the frame. Due to the shape of the frame, this required some milling. This was the first piece that I laminated. I was able to get an 18" diameter. As mentioned in the video, I wanted to retain the hinge cut outs. I positioned these closer to the edge than the middle as I wanted them to ba all or partially on the rim of the platter. 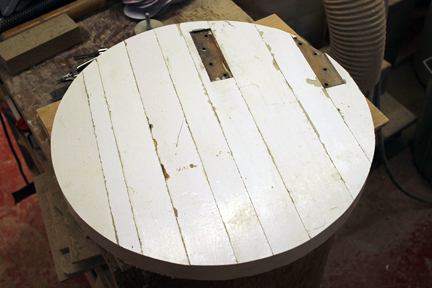 The rim will be the original painted surface of the wood. There was just enough material here with painted surfaces to squeeze out another 18" diameter platter. 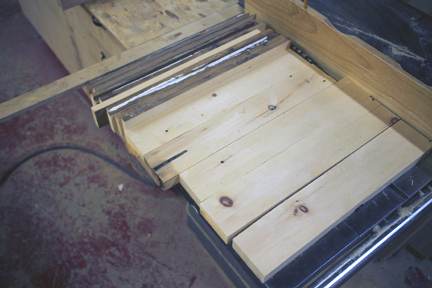 In the video above, I mentioned that I would not need the full thickness of the wood for my platters. This is the material I trimmed off the bottoms of the painted pieces. After I had further milled this wood I found that I had enough for another 18" diameter platter but without the painted surfaces. There was still some wood left over and I felt that there would be enough for a small vase. While working with the blanks of the two platters that had the original finish on them I noticed that the paint had a tendency to chip off. To pevent this from happening in the finished pieces I prepared the blanks for a surface of clear epoxy. The video to the right explains how I went about this. Both this video and the next one are considerably longer than the previous ones but they show the complete turning process of the platter. 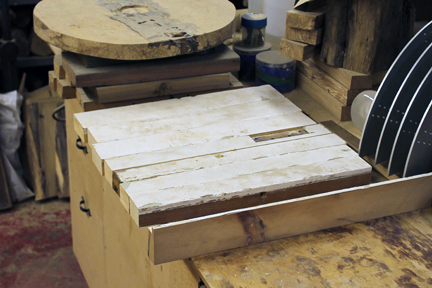 In this video I am turning the front of the platter blank. The epoxy on the surface of this blank is extremely hard and dulls down the gouge very quickly. I am sharpening my gouge each time the piece is stopped in this video. The long stringers that come off in the turning are epoxy. Here I am turning the back of the platter. The back is relatively easy as I am turning mostly pine. There is some epoxy from the front where there are screw holes. The difficulties arise when turning the rim. 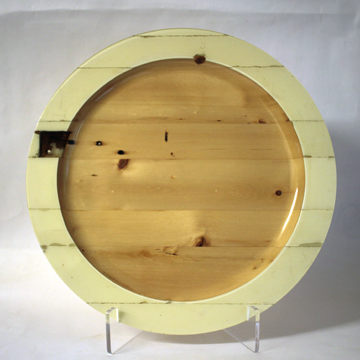 Three quarters of the rim is pine but the last is pure epoxy. With the epoxy being much harder than the pine the gouge tends to slip out when it gets to it. The gouge also dulls very quickly when it gets to the epoxy. Turning these platters takes patience. I can't skip steps or take short cuts. 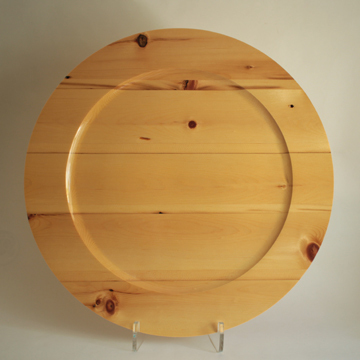 Numerous coats of finish later and a final turning and sanding of the reverse side has produced this handsome platter. I called this piece "Langdon Hall Country House Hotel". The story of Langdon Hall is on the back of the platter. This pieces has been sold. The second platter was turned and was ready to put in the show. I used it as a prop in a short disertation in July of 2015 and was approached afterward regarding the availability of the platter. Needless to say, I sold the second platter. 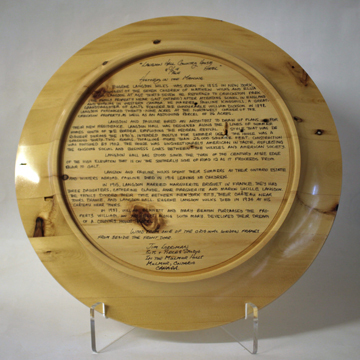 This piece was called "Now and Then" and had the same story on the back as the first platter. When making these first two platters there was some material left over. It was enough to make a third piece. This platter does not have the old paint or the hinge recesses. 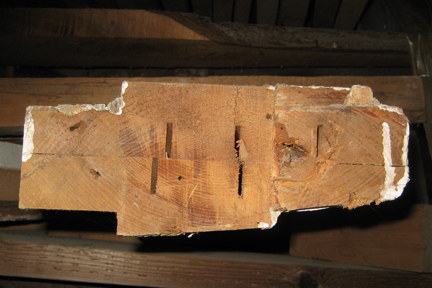 However, it is a prime example of the quality of pine that was available in the late 1800's and early 1900's. 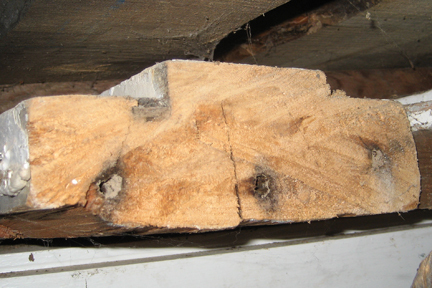 Wood like this is extremely rare as timber. It is only through the recycling process that we are able to get a glimpse of the wonderful woods they enjoyed over a hundred years ago. The Langdon Hall story is on the back of this piece also. 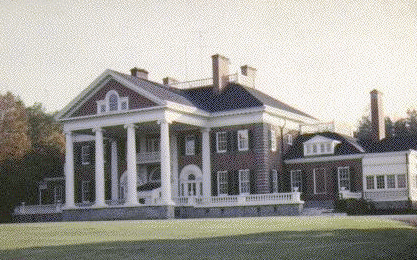 The following is an edited version of the early history of Langdon Hall. The full version appears on the Langdon Hall website, here. Eugene Langdon Wilks was born in 1855 in New York, the youngest of the seven children of Matthew Wilks and Eliza Astor Langdon. At age thirty-seven he returned to Cruickston Park (the family property near Galt, Ontario) after attending school in England and working in Western Canada. He married Pauline Kingsmill, a great granddaughter of Galt’s founder, the Honourable William Dickson. In 1898, Langdon purchased twenty-nine acres at the northwest corner of the Cruickston property, as well as an adjoining parcel of 76 acres. Langdon and Pauline hired an architect to draw up plans for their new residence. Langdon Hall was designed along the lines of summer homes south of the border, employing the Federal Revival style that was de rigueur during the 1890’s. Intended mostly for summer use, the house was a spacious thirty-two rooms, totalling more than 25,000 square feet. Construction was finished by 1902. The house was unquestionably American in taste, reflecting the ongoing social and business links between the Wilkses and American society. 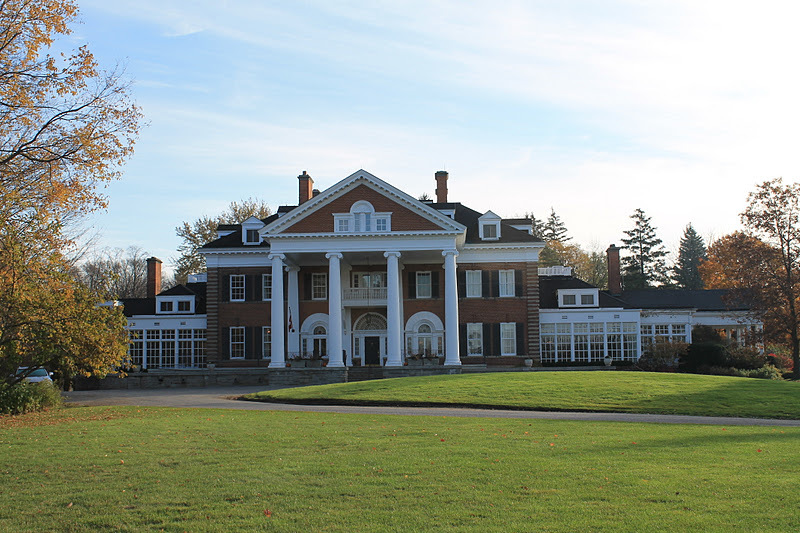 Langdon Hall has stood since the turn of the century at the edge of the high elevation that is on the southerly side of Road 12 as it proceeds from Blair to Galt. Langdon and Pauline Wilks spent their summers at their Ontario estate and winters abroad. Pauline died in 1914 leaving no children. In 1915, Langdon married Marguerite Briquet in France. They had three daughters, Catherine Claude, Anne Marguerite and Marion Lucille Langdon. The family divided their time between New York City, their château near Tours, France and Langdon Hall. Eugene Langdon Wilks died in 1934 at his château near Tours. In 1987, William Bennett and Mary Beaton purchased the property. William an architect, along with Mary, developed their dream of a Country House Hotel. Langdon Hall Country House Hotel as it is today.